I was in Montreal a few weeks ago for the International Travel and Tourism Show, and in my downtime I took a few hours to do what is probably now my favourite Montreal activity - visiting water spas. Finnish baths are very popular in Quebec, unlike Ontario, and they're a natural choice for a hot springs fan like me. For this particular visit, my spa of choice was Bota Bota, spa-sur-l'eau; a classy water spa built in a refurbished ferry moored in the Old Port area of Montreal. It was a smidge more expensive than Spa Scandinave, which I visited in May, but to do the three-hour "layover" option on a weekday put the price at $45 (as opposed to the $65 for an all-day pass on a weekend). The price includes the bathrobe and towel, but not sandals, which are mandatory, so you must bring your own. This seems to be a trend for water spas, or at least ones located in North America. In Japan, nobody wore sandals from bath to bath - why bother? These places do have many other services that the visitor may want to make use of that aren't located in the bathing area - massages, manicures, facial treatments, etc - so sandals are certainly of use to them, but for visitors just on the water circuit, having to buy a pair of flip-flops at the gift shop to get from the changing room to the bath doesn't make a lot of sense to me. Fortunately, I read a review on Yelp mentioning the sandals this time, and dug my summer shoes back out of storage. Body Blitz in Toronto supplied us with sandals, as did Spa Scandinave, so water spa fans should be aware that the rules do change from spa to spa. I recently visited a water spa in Ottawa that didn't even supply their bathrobes with the entry fee - more on that in another post! The water circuit at Bota Bota is located almost entirely outdoors, which was a pleasant surprise. There are multiple decks, and the baths are on Decks 3 and 4, on opposite ends of the ship. 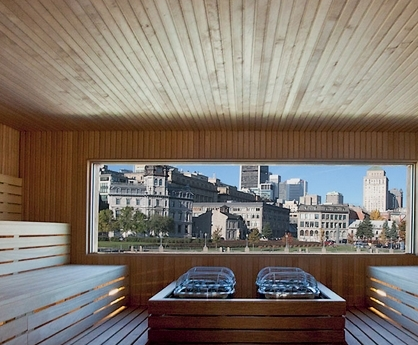 The open-air bath on Deck 3 is expansive and colourful, with an almost-view of Vieux-Montréal (the sides are a bit too tall to see out comfortably from inside the tub) and a relaxing feeling. There's a cold-water barrel tub located just inside, as well, to submerge in and open the pores. A steam sauna and Finnish sauna round out the circuit on this floor, and bean bag chairs are scattered around inside and out to help make guests comfortable. Deck chairs are also available outside. Deck 4 has a smaller bath which is more like a hot tub, with water jets. It faces the St. Lawrence River and offers a view of mostly-industrial buildings on the other side. At night, however, this view is very pleasant. An outdoor cold-water barrel bath is located just around the corner, by the deck chairs, and there are spaces here to hang up your robe and towel. This floor also has a Finnish sauna and relaxing space inside. Reviews I read mentioned that Bota Bota's facilities are a bit cramped, and given that it's located on a refurbished ferry, space is certainly limited. I didn't find it cramped, however, not even in the dressing room. The changing facilities are not the best I've seen, but not bad. I prefer some sort of sterilization when I use public hair items, and Bota Bota did not keep barbicide or a UV sterilization cabinet for its combs, so I was relieved that I remembered to bring my own hair items. I've gotten too used to Japanese super-sento, where you often can take a clean brush from the UV unit, use it for yourself and toss it into a bin to be cleaned and sterilized before it gets re-used. The shampoo and conditioner here were okay, but not great. I did appreciate the presence of a hair straightener, though there weren't many dryers. Bota-Bota's main draws were the atmosphere and the outdoor baths. You haven't lived until you've relaxed in an outdoor bath in winter! For the price I paid it was a very nice evening, but with Spa Scandinave right down the street and offering free tea and cucumber water as well as sandals, I'm not sure their peak prices are good value. Still, for me, the outdoor bath made it completely worth it, and I hope to go back someday, after I've covered a few more of the spas Montreal offers. Magnifique! All images courtesy of the Bota Bota website.